World War I, usually called the First World War in the Commonwealth and called The Great War in its time, was one of the largest armed conflicts in history. It took place between 1914 and 1918, mainly in Europe and Africa, though a few naval battles occurred in Asia and the Pacific Ocean. The Western Front, running through Belgium and Northeastern France, was particularly destructive. Some called it "the war to end all wars", but that did not work out; it was followed only about twenty years later by the even more destructive World War II. In the 2010s, the centennial anniversaries, and the passing away of the last veterans, have revived interest in the war. It has also gotten more attention in narrative media as the 2010s focus more on morally ambiguous characters and plots to which WWI lends itself better than WWII with its commonly accepted heroes and villains. In 1914, Austrian Archduke Franz Ferdinand was assassinated in Sarajevo by Serbian nationalists. This event sparked tension between Austria-Hungary and Serbia. As the Russian Empire backed up Serbia and Germany gave a "blank check" to Austria-Hungary, other great powers joined the conflict. Though a single event started the war, many historians argue that conflict between Europe's great powers was almost inevitable and debate over which nation is most responsible for the war is still ongoing 100 years later. World War I lives in infamy as the war that introduced weapons of mass destruction — poison gas — onto the battlefield. It was also the first war in which the recently-invented airplane was used in combat, though not the first war to see aerial bombardment, which had been employed from balloons and airships decades earlier. The 1919 Treaty of Versailles held the Central Powers, especially Germany, responsible for the war, and liable for what were seen as harsh reparations. Public resentment over these reparations would later be a contributing factor in the rise of Adolf Hitler and lead up to World War II. However, neither the reparations nor the territorial losses imposed on Germany were notably harsher than what Germany itself had imposed on Russia in the Treaty of Brest Litovsk a few months earlier. By contrast, Italian fascism arose over what was seen as a "vittoria mutilata" or mutilated victory by some and the territorial gains Italy made in the war were widely seen as not enough and the economic woes after the war were blamed on the Allies and numerous internal and external foes. The war brought down several empires — Austria-Hungary, Imperial Germany, the Russian Empire and the Ottoman Empire — and sparked the formation of the Soviet Union. The League of Nations, which was the precursor to today's United Nations, was formed in the aftermath of the war, though its effectiveness was limited by the fact that the United States never joined and League of Nations sanctions or decisions were frequently ignored, leading to the departure or expulsion of the Soviet Union and those of the major Axis Powers, Germany, Italy and Japan. The tensions within Europe were only briefly resolved; World War II repeated many tragedies of the first war and introduced new horrors. The war had a severe impact on culture and literature with significant anti-war works like All Quiet on the Western Front and glorifications of war being written by its veterans, as well as at the home front where propaganda as we know it today was produced for the first time. In Germany the budding motion picture industry was consolidated and propped up by the state into the juggernaut that would give the world German expressionism and movies like Metropolis in the interwar years. Other countries took notice, and Soviet propaganda after the war and WWII propaganda heavily relied on movies. In Italy, Benito Mussolini departed from the Socialist Party over his views on the war while an Austrian wannabe artist of the name of Adolf Hitler found his first purpose in life (and a political ideology) during his service for the Bavarian army. The war has been called "the original catastrophe of the 20th century" and many of the horrors or World War II and the Cold War would not have been possible without the catalyst of this war. Germany held a number of colonies at the outset of the war. Given Germany's naval inferiority to the UK and the small garrisons deployed in the colonies, it was no surprise that most were in Allied hands by late 1914. However, the German force — aided by local "Askari" — in German East Africa (now Burundi, Rwanda and mainland Tanzania) managed to fight on, evade capture and even achieve small victories against overwhelming odds until 1918 only giving up after the armistice of Compiegne. The MV Liemba — now a ferry on Lake Tanganyika and a tourist attraction — was built as an Imperial German naval vessel. Prince Faisal, assisted by British intelligence officer T.E. Lawrence (Lawrence of Arabia), led an Arab revolt against the Ottoman Empire. They took Aqaba with a surprise attack, and later took Damascus before the British force coming from Egypt through Palestine could reach it. Today it is fairly common for residents of Saudi Arabia to go out into the desert to view places where Lawrence's lads blew up the Turks' Hejaz railway which ran from Damascus to Medina. Bedouin routinely travel this area in small two-wheel-drive Toyota trucks; anyone else needs a convoy of four-wheel drive vehicles with tow chains to rescue each other when they get stuck. The war between Austria-Hungary and Italy (1915-18) was mostly static in terms of front movement but saw brutal fighting in next to impossible conditions of a still mostly untouched high mountain range. In the latter years, mining and explosives increasingly became a means of warfare, and traces of this are still visible. 52.133323.66671 Brest. The site of the treaty of Brest-Litovsk between Soviet Russia and the German Empire, signed in March 1918. The new Bolshevik government withdrew Russia from the war and made a separate peace, despite commitments previous governments had made to their allies. 50.852.88332 Ypres. There were several large battles here; the first was in the autumn of 1914 and the second in the spring of 1915, each with around 100,000 casualties. The second saw the first military use of poison gas, by the Germans. The Third Battle of Ypres in late 1917, better known as the Battle of Passchendaele, had at least 400,000 casualties. 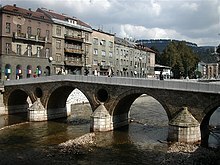 43.857518.4288893 Sarajevo. Austro-Hungarian Archduke Franz Ferdinand was assassinated on the Latin Bridge on 28 June 1914, setting in motion a series of events that led to the beginning of World War I a month later. A plaque commemorates the event. 50.3792.7745 Vimy Ridge (near Lens). A bitterly fought battle in early 1917 in which Canadians drove Germans off some high ground, with heavy casualties on both sides. There is a a 100-hectare (250-acre) preserved battlefield park with the Canadian National Vimy Memorial near the center. This is the main monument for Canadians who fell anywhere in Europe during this war. 49.4273612.9064196 Forest of Compiègne. Here the armistice ending major combat operations in the West was signed on November 11, 1918. November 11 has been "Remembrance Day", "Veterans Day" or "Armistice Day" in various countries ever since. Hitler later had the exact same railway carriage in which the armistice was signed brought back to force his French counterparts to sign the 1940 French capitulation here. The original railway carriage was later lost, but a replica sits on site today. 54.325210.14058 Kiel. The German navy was stationed here and when the high command wanted them to sail out at a point in time when defeat seemed inevitable, the sailors started what is now known as the November revolution of 1918, and ended up toppling the Kaiser and installing (short-lived) soldiers' and workers' councils. The fighting between Austria-Hungary and Italy between 1915 and 1918 was particularly fierce and fought in harsh terrain. A big part of the war effort were mines and counter-mines, and sometimes this involved literally blowing up (the tops of) mountains. 40.36722226.45511 Gallipoli. The ill-fated invasion of the Ottoman mainland, a brainchild of Winston Churchill, is credited with creating the Australian and New Zealand national "ANZAC spirit" as the Australia New Zealand Army Corps (ANZAC) suffered relatively high casualties. 49.92915022.93259641 Historial of the Great War Péronne (Historial de la Grande Guerre Péronne), Péronne, France. Near Arras, which is a good base for exploring the World War I Somme battlefields, it represents the everyday life of the soldiers at the front during that harsh time as well as the life of the civilians and the huge social changes. Somme Trench Museum (Musée des Abris - Somme 1916), Albert, France. The museum is inside a tunnel that dates back to the 13th century, and was rehabilitated into an air-raid shelter in 1938. It’s 10 m below ground, and explores the life of soldiers in the trenches during the 1st of July 1916 offensive. 39.080278-94.5861114 U.S. National WWI Museum and Memorial, Kansas City, Missouri, USA. America's leading institution dedicated to remembering, interpreting and understanding the Great War and its enduring impact on the global community. 45.57510.8186115 Fort Wohlgemuth & World War I Museum, Rivoli Veronese, Italy (near Verona), e-mail: info@museowalterrama.it. The fort was built between 1850 and 1851 on the Mount Castle (227 m), north-west of Rivoli. The fort hosts a museum on World War I and on vintage radios. Military museums and sites in Australia — The First World War (the Battle of Gallipoli in particular) is possibly the most famous war involving Australian troops. This travel topic about World War I is an outline and needs more content. It has a template, but there is not enough information present. Please plunge forward and help it grow!